It's a beautiful day for hot springs hunting in Great Salt Lake Valley! I started with Wasatch Warm Springs, which seemed the easiest to find. But after wandering around Warm Springs Park (840 N 300 W) for 20 minutes and finding nothing but grass and recreational equipment, I scratched my head and wandered over to the old resort building north of the park. 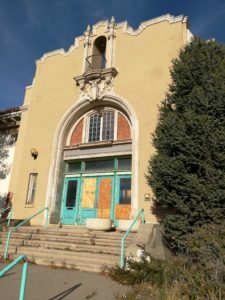 The large, abandoned building’s majestic mission-style architecture clashes with its cracked chimney, boarded windows, and crumbling stucco facade. I peered inside and saw colorfully painted walls. A plaque by the door says the bathing facility closed in the 1970s and reopened as a children’s museum in 1983. No children play here now. Catching a whiff of sulfur, I wandered into North Gateway Park on the other side of the resort building. Here, at the north end of the park, I finally found the warm springs for which they named the neighboring park! (Great job, parks service naming committee.) Choked with an invasive species of reeds, the pools are hard to see from the paved pathways. To get a better view I went off-trail and photographed them from the hillside behind. The pools gurgle as new spring water fills them. Emerald algae glitters beneath the surface. A whiff of sulfur stings the nose. Posted signs warn that bathing is strictly prohibited. The warm springs water and fertilize a copse of invasive phragmites reeds. 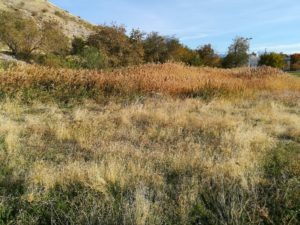 Phragmites crowds out native plants, and the Utah government spends a lot of money to control it on the shores of the Great Salt Lake. But to the casual observer, the tall, plumed golden stalks are hard to hate. The breeze whispers through them with a pulsing hiss, a sibilant beat I strained to hear over the roar of passing cars. 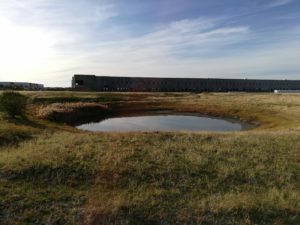 If you don’t mind a little trespassing, you can also check out Hobo Hot Spring, so named because its proximity to the railroad tracks makes it a convenient bath for train-hopping vagrants. 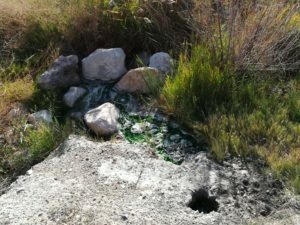 Hobo Hot Spring consists of two marshy pits located on private land at the east end of John Cannon Drive, west of the Salt Lake City Airport. Would you like to own a hot spring? Hobo Hot Spring sits on a 20-acre lot zoned for manufacturing, and it’s for sale. Whoever buys it will likely use the spring for geothermal building heat. we came to a Hot Spring of pure Water, about 8 feet wide at the top descending in a tunnel shape, which we sounded by a piece of Iron, & rope, & found to be 13 feet 3 inche[s] deep – [T]he water is nearly boiling hot & bubbles of air continually rising – [O]n the top was the remains of a bird that no doubt had alighted on it, & was scalded to death. West of this Spring [a]r[e] several other Springs which run into a Lake, surrounded by tall grass. 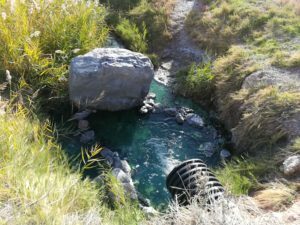 The surface expression of Crystal Hot Springs covers about 70 acres, nearly all of it now located within the premises of Utah State Prison, which uses the water for building heat. Some of the water also heats a commercial greenhouse, and the discharge from the prison and greenhouse goes to a fishery operated by inmates. However, Crystal Pond, that lake described by Bullock, still exists! 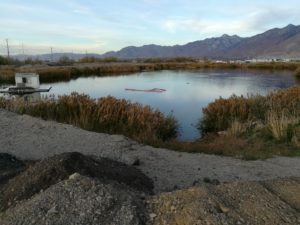 Located behind a strip mall at 14557 S 790 W in Draper, the lake sits amidst a commercial scrap yard. Even so, the scene is idyllic. Waterfowl croak and flutter atop its surface. Fish breach the water with a splash, and animals rustle in the reeds. The water is reputed to average 80 degrees Fahrenheit, though the temperature has been dropping due to discharge from the prison. 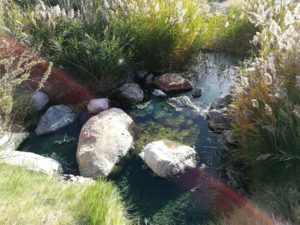 The most useful resource I found for locating out-of-the way hot springs is the Hot Springs Enthusiast page for Utah, complete with latitudes and longitudes that can be used on Google Maps. Please pay attention to posted signs and don’t do any more environmental damage to these sites than civilization already has. Remember that these springs are ancient and sacred. You may also want to do a little research into their histories before you visit them. I find that knowing the story of a place helps bring it to life in a way that simply visiting it does not. And above all else, remember: have fun! 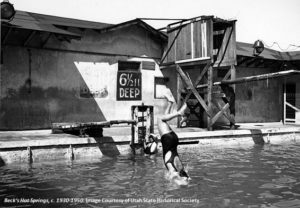 This entry was posted in Environment, History and tagged adventure, environmentalism, hot springs, resorts, Salt Lake Valley, springs, tourism, warm springs by Christopher Smith. Bookmark the permalink. There is also one along the Jordan River parkway trail about a mile and a half south of 12600 south. Follow the trail south until it climbs to a crest and as you start to descend towards the sewage treatment plant it’s on the West side of the trail. It’s posted no swimming and is very hot. A poor woman lost her dog to the heat a few years ago.